One of the most important parts of keeping your child’s mouth healthy is to take that mouth for regular dental visits, at least every 12 months throughout life. Not only will this keep your child’s mouth its healthiest, but the dentist can be the first one to notice the clues of important systemic diseases, even as serious as AIDS, so that early treatment can prevent later complications. The American Academy of Pediatrics recommends starting regular dental visits at age three. The American Academy of Pediatric Dentistry and the American Dental Association recommend the first visit at age one. 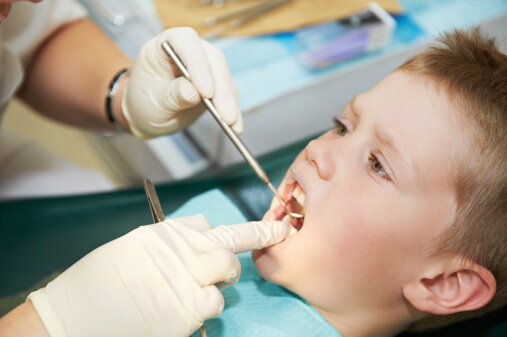 I recommend a first visit by the age of two (and at any point earlier if there are any dental questions or concerns) mainly to make sure your dentist can screen for baby-bottle tooth decay before too much damage is done. If your pediatrician or family practitioner is observant and concerned about oral health, waiting till the end of the recommended spectrum should be fine. Pick a dentist who seems great with kids. The dental office in our building has a great rocking horse, video games and a wall where shooting stars fly through space. If you invest a little silliness into making visits to the dentist fun, your little ones will be more likely to enjoy dentists and practice what they preach. My daughter is 13 months and she still have no teeth should i be worried that her teeth is not growing. ?